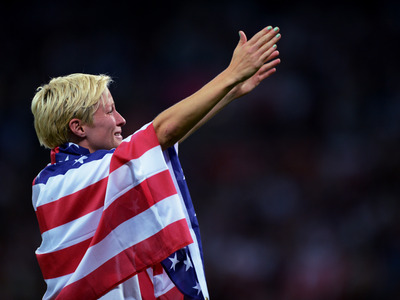 Michael Regan/Getty ImagesMegan Rapinoe #15 of the United States celebrates with the American flag after defeating Japan by a score of 2-1 to win the Women’s Football gold medal match on Day 13 of the London 2012 Olympic Games. The Federal Reserve announced the results of its latest round of banking stress tests Thursday, saying that the 33 largest financial institutions in the US look safer. The tests, conducted since 2009 and mandated by the Dodd-Frank Act since 2011, attempt to determine just how safe financial institutions with more than $50 billion in US-based assets are. The Fed runs a hypothetical test of a recession and severe recession and models the impact of the downturn on the banks’ balance sheets. In the current modelling, the severe recession would include unemployment of 10%, a decline in home prices of 25%, and a stock market drop of roughly 60%. In this scenario, the Fed said the 33 institutions would lose $385 million on loans they have outstanding. Additionally, the Fed looks at the ratio of capital that the institutions hold against their risky assets, called the Tier 1 common capital ratio. The lower the ratio, the more worrisome the institutions’ financial situation. The institutions’ ratio stands at 12.3% as of the fourth quarter of 2015. Under the severe recession scenario, that ratio would be 8.4%. This ratio was just 5.5% at the start of 2009. For reference, anything above 6% is considered “well-capitalised”, between 4% and 6% is “adequately capitalised”, under 4% is under-capitalised, and under 3% and 2% are considered significantly and critically under-capitalised respectively. Those firms with undercapitalized rankings or below are not allowed to return cash to shareholders through dividends or buybacks.